Rats and mice have been a problem for humans many centuries now. Dating back in the 3000 B.C.E in Egypt, the Egyptians tried to control the rat and mice population by introducing cats in their granaries. From then up to date, people have been able to come up with different methods of controlling rat population such as using poisons, snap rat traps, glue traps, rat baits, and now, electric traps. Electric rat and mouse traps are very effective and convenient. They are humane as the rodent doesn’t suffer a lot before it succumbs to death. When the rat is captured, you’re alerted and able to dispose of it in time. Also, the kids and pets in your home are safe as they cannot access it. With this in mind, here are the best electric mouse and rat traps for your home or commercial structure. We have selected top rated 10 rat and mouse traps that really works. If you’re one of those people who believe rodents shouldn’t be killed but released far away from home, then this is the trap for you. The ASprint humane mouse trap works effectively in trapping the rat or mouse inside without escaping. The live trap features a non-slip back which is very stable and will stay in place. In addition, it has air holes and the rat captured will not suffocate to death. The transparent design allows you to view the caught critter without opening the spring door. To effectively trap the rat, set the humane mouse trap to a boundary fence or wall where you suspect or see rodent activity. Also, ensure that the opening of the trap is very close to the wall. Immediately the rat enters the trap, the spring door will shut behind it and you can view the rat through the transparent lid. Release it in the woods and reuse the trap. The trap is id and pet safe, so you don’t have to worry about the kid being hurt. The Abco tech electronic humane rodent zapper will alert you when the rat or mouse is caught. No more foul smells from dead rats in the ceiling or walls. 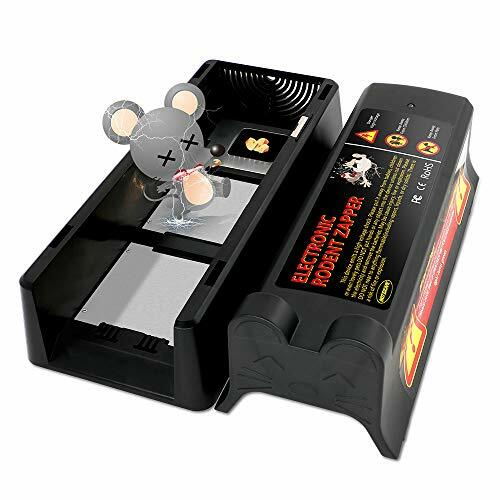 This electric rat trap uses 4 alkaline D cell batteries. These are able to kill up to 30 rats before changing them. The powerful 7000 v electric shock kills rodents instantly, so no mess or pain is experienced. When the rat enters the trap, the LED indicator will flash red when it is being killed and after it has been killed it will flash green. Also, when the battery is low and needs replacement, the LED indicator will flash red and green. The rat or mouse caught has no time to escape as this electric trap features a smart detection technology. It zaps the rodent immediately it steps on the metal plates. Use with caution as it can be dangerous to kids and pets. Rat poisons and baits can be harmful to kids and pets. Instead of endangering the life of your family members, why not get the Pestrax electronic rodent zapper? This trap is very humane and you will not see any bloody site of a dead rat or mouse. The trap delivers 7000 volts of electric shock that kills the rodent instantly. This is on 4 D batteries. Unlike other electric traps, this one features a free extension cord with a light indicator that emits a blue light when the rat is trapped. Also, it has red and green indicators for showing when the cat is being killed and after it has been killed, respectively. The Pestrax electronic rodent killer uses smart circuit technology to kill the rat immediately it enters the trap. It is kid and pet safe, so your pets and kids are protected from it. Furthermore, you can set up the trap indoor or outdoor. Use it to catch rats, mice, squirrels, and other rodents. Then, dump them in the dustbin. With a lifetime warranty, this is a very convenient and reliable trap to have in your house. Aspecteck electronic rat trap will help you reduce the rat population within days. This trap can be set both indoors and outdoors. Just ensure that there is no water which may cause the batteries to drain quickly. One of the features that set apart this device from other electric devices is its exclusive patented accident avoidance technology that cannot harm humans but only rodents. Moreover, it can be operated using AA batteries or plug-in adapter. So, you are not just limited to one source of power. The electric trap is very effective in killing rodents like chipmunks, rats, mice, and squirrels. Thanks to its exclusive intelligent repetitive electric shock system that detects and kills the mouse instantly. The device produces 7000 v volts which send the rat to death and if it moves again, it is killed for the second time. Discarding the rat is very easy and you don’t have to touch it. Clean the device and reboot it. 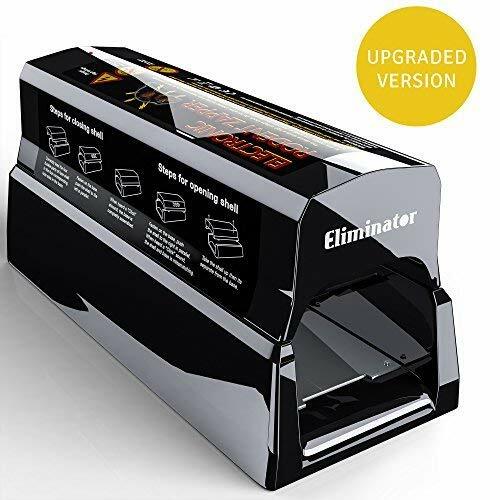 As it name states, the Eliminator robust electronic rat and rodent trap is very effective in reducing the mice population. The stylish and sleek device is very easy to operate and it is also reusable. The Eliminator features a precision detection technology that will eliminate the rat immediately it enters the trap. No mess will be created but the rat will be killed with a 7000 volts electric shock. You can opt to use the plug-in or batteries to power on the device. 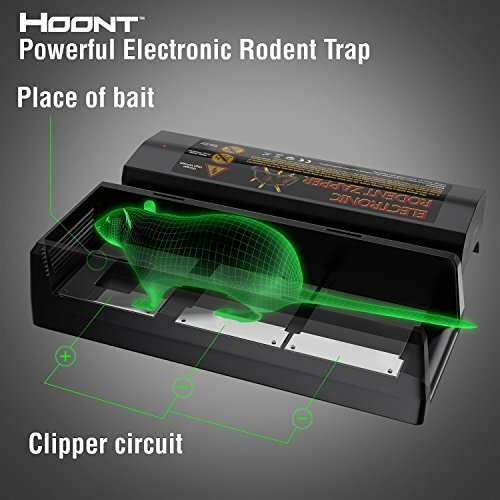 The eliminator robust rat trap can kill up to 30 rats on 4 D batteries. Just set up as recommended in the instruction manual and use good bait like peanut butter. If the trap is hidden, ensure that the extension plug-in indicator is within view so that you can tell when it has captured a rat or mice. 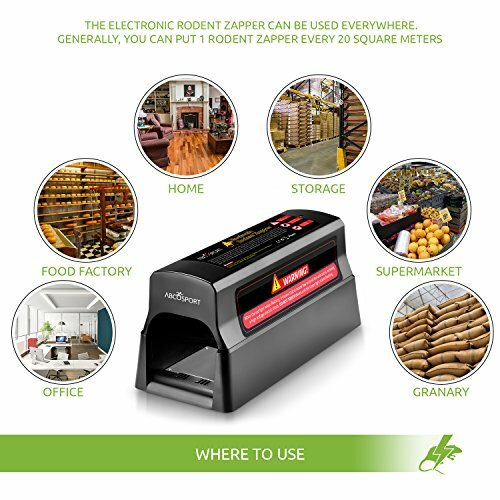 With the PestNoMore rodent zapper, your job of eliminating rats has not only been made easy, but you will also have an easy time cleaning the device. This is because it separates into two parts. On top of that, you can power on the device using either the AC mains or batteries. When the rat or mice enter the device, it is instantly killed. But similar to many other electric traps, you will have an easy disposal of the dead rat and cleaning is very easy and quick. The notification light and alarm signals will alert you when a rodent is caught. So, just bait, wait, and get rid of the mice. Hoont powerful electronic mouse trap is powered by either batteries or plug-in. The device is fitted with an advanced smart detection technology that ensures every rodent that enters is killed instantly. There is no mess and cleaning after disposing of the dead rat is easy. When the rodent enters the trap, 7000 volts is delivered and the indicator light together with the beeping sound will alert you. This trap is very safe to use around pets and kids. It can be used to kill rats, mice, chipmunks, squirrels, and many other similar rodents. Also, it is very humane and easy to use. 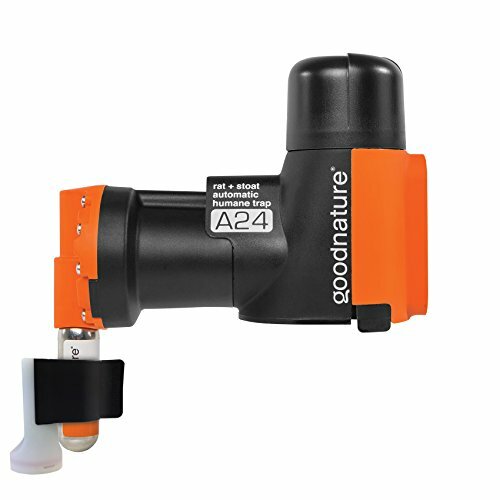 Goodnature automatic rat and mouse trap is very effective in performance. This device is powered by C02 powered shots and it automatically resets itself after every kill. The reset function uses batteries. Simply install it in indoors or outdoors to eliminate the rat or mice population in your area. It is toxic free and safe to use around kids and pets. The weather-proof device can kill up to 24 mice or rats before replacing the CO2 canisters. This is a very humane way of killing rats as they won’t suffocate a lot before being eliminated. Whether you want to get rid of rats, squirrels, mice, or chipmunks in your yard, house, garage or agricultural building, the Pestzilla pest control rat trap is the best choice for you. The device features a precision rodent detection technology that will eliminate any rodent that steps on the metal plates. 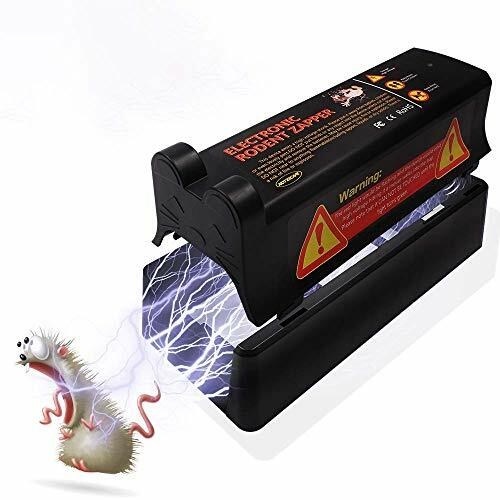 It delivers 7000 volts which are strong enough to kill the rodent instantly. The device has the option of using batteries or plug-in. It is also easy to use and cleaning isn’t an issue at all. Reuse this electric trap to get rid of the rodent problem in your house. 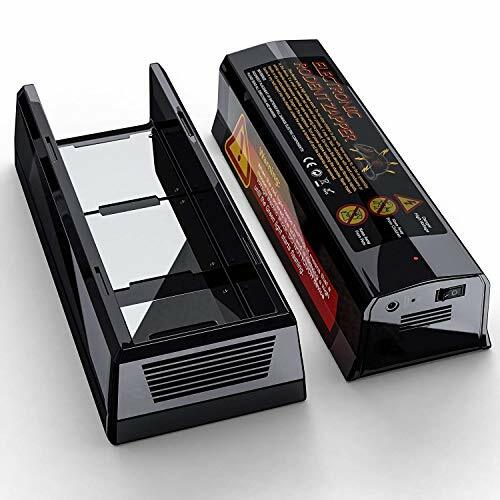 Featuring the intelligent and innovative wireless circuit sensor, the Pestai electric humane mouse trap is very effective in eliminating rats, mice, chipmunks, and squirrels. The rodent receives a 7000-volt electric shock when it steps on the metal plate. It kills instantly with no mess or escape. Use either a plug-in or 4 alkaline D batteries. This humane trap is very easy to use and it will alert you when the rat is killed. Discard the dead rat, rinse the trap, and reset it. Also, buyers of this device get a 30-day money back guarantee and a 1-year warranty. Electric traps are one of the most humane ways of eliminating rat or mouse population. There is no mess created during killing them and you won’t even get to see the dead rat or mice. Also, disposing of them is very easy and you get alerted immediately the rat is caught. Choose an electric trap with good reviews. Also, ensure that it is sturdily built, reliable, safe, and user-friendly. Question: How do I ensure that the rats and mice don’t shy away from the electric trap? Answer: Rats and mice are very intelligent creatures. So, if they see a new food or object, they will be wary of them. Before you set the electric trap, you should first put it in position without switching it on so that the rats can get used to it. After they have got used to the trap, you can now set it and catch them. Question: What are the benefits of using an electric trap over other types of traps? Answer: Glue traps and snap traps are dangerous to your pets and kids, while electric traps are not. Also, you won’t smell the bad odor from the dead rats as they are killed and disposed of instantly. Another benefit is that electric traps are more humane than other kinds of traps. With electric traps, killing the rats or mice is quick, unlike baits where they have to suffocate slowly or for some days. Question: Can an electric rat trap be used outdoors? Answer: Yes, it can. You can use an electric trap outside your house as long as it doesn’t get in contact with water. Therefore, you should place in an area where water can’t reach it. Question: What powers electric mouse and rat traps? Answer: A good number of electric mouse and rat traps are powered by 4 AA batteries. The batteries can be used to kill at least 20 rats before having to replace them.